(Watertown, MA) The impact that women have had in shaping our view of the world is so profound and infinite it could fill the sky. Often, their significance is overlooked, but it’s lovely seeing these roles brought to light in the arts. In its New England premiere production, Flat Earth Theatre brings to life the love, loss, and feminism of Lauren Gunderson’s Silent Sky. Henrietta Leavitt (Erin Eva Butcher) is an aspiring astronomer with dreams and career goals much larger than a small town in Wisconsin can contain. But even after accepting a job at Harvard Observatory, she realizes that the glass ceiling is much thicker than she realized. 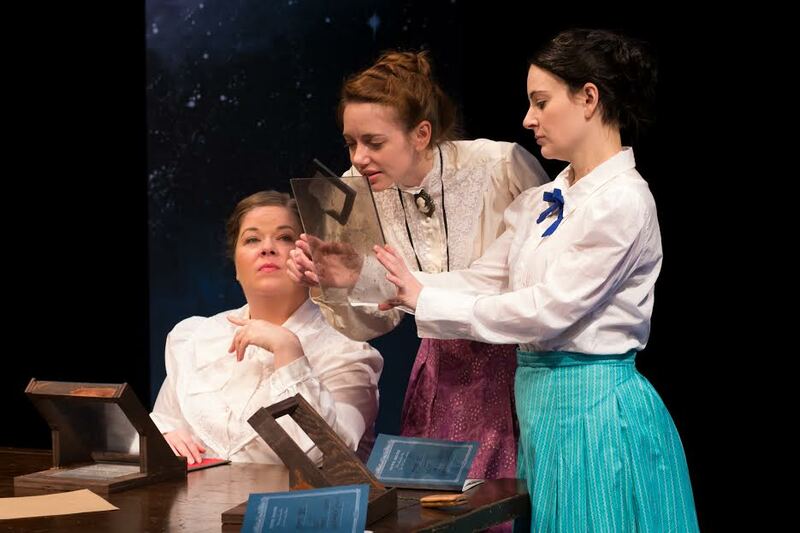 Along with her new coworkers, Williamina Fleming (Juliet Bowler), a Scottish straight shooter, and Annie Cannon (Cassandra Meyer), a by the books, Type A type, Henrietta goes through the mundane task of cataloging the stars. However, she becomes so desperate for a challenge that she uses her extra time to determine the significance of a star’s pulse, and how it can be used to determine distance from earth. Butcher as Henrietta does a nice job of portraying a passionate woman determined to pursue her dreams while subconsciously pushing away her family, all without making the character’s motives feel forced or unnatural. Bowler as Williamina successfully wins the audience over with her charisma, but the character wasn’t able to grow past the humorous foreigner cliché. Meyer as worker-turned-activist Annie is a bit stiff and makes the character unrelatable, but maintains good comradery with her peers. However, most of the characters in Silent Sky are stock. This is likely a reflection of the show itself, which, while a good show with good flaunts of feminism, isn’t pushing the envelope to deliver or contribute anything new to 21st century feminism—it’s literally stuck in the 1800s. It fails to tell a story that feels fresh and caters to a white audience. One of the striking beauties in Flat Earth Theatre’s production are the dozens of strings of bulbs cascading from the ceiling to represent the night sky. The mechanical constellations, a collaborative effort between set designer Deb Reich, lighting designer PJ Strachman, and technical director Leigh Downes, creates a subtle spectacle and provides a nice visual depth to the show. The most compelling aspect of Silent Sky is its use of feminism. Seeing a small fleet of women actively working in the STEM field is a really great and important message. Watching Annie Cannon evolve from a desk researcher to a pants-wearing suffragette was also fun, but it fell too in line with the predictability of the show. In fact, the timeline of this historical fiction constrained it and didn’t allow it to expand past its time period. If you want to see the impacts of women in STEM, Silent Sky is a good stepping stone. But with new critically acclaimed pieces like Hidden Figures coming out, it may be time to start telling fresh stories about how all types of women are impacting these fields of research and shaping our world every day. Silent Sky runs for 2 hours with one intermission. To purchase tickets, click here. This entry was posted in Drama and tagged 2017, Annie Cannon, Cambridge, Cassandra Meyer, Deb Reich, Dori A. Robinson, Erin Eva Butcher, feminism, Flat Earth Theatre, Harvard Observatory, Hidden Figures, Juliet Bowler, Lauren Gunderson, Leigh Downes, MA, March, PJ Strachman, Silent Sky, STEM, The Mosesian Center for the Arts, Travis Manni, Watertown by Travis Manni. Bookmark the permalink.